John McArthur must be smiling. But even the former Dean of Harvard Business School--the brains behind the concept of creating a provider network "too big to exclude" from any insurance company's product line-- could not have anticipated the degree to which the state's body politic would stand by and watch the aggrandizement of economic power that has occurred since the Partners Healthcare System was created in the early 1990s. Indeed, beyond watching, the state is now poised to assist in a continuation of that trend. The ability of Partners to demand and receive above-market payment rates from insurers has been well documented. There is the apocryphal-sounding story of CEO Sam Thier saying to the head of Blue Cross Blue Shield, when the latter balked at a PHS rate request, "Bill, this is what good health care costs." Bill paid it. Then there was the attempt of Tufts Health Plan, a second tier insurer (in terms of size), to pay less. Partners started a million-dollar marketing campaign to inform Tufts subscribers that they would no longer be able to go to Massachusetts General Hospital or Brigham and Women's Hospital. Those subscribers threatened to leave the insurer in droves. "Tufts surrendered in little more than a week." Price increases, not increases in utilization, caused most of the increases in health care costs during the past few years in Massachusetts. Higher priced hospitals are gaining market share at the expense of lower priced hospitals, which are losing volume. The commercial health care marketplace has been distorted by contracting practices that reinforce and perpetuate disparities in pricing. The latest evidence of the degree to which the company's political strategy has been effective is in the passage of legislation by the House and Senate this week. The bill, now on the Governor's desk, has been erroneously described by one news report as "setting the stage for Massachusetts to become the first state to ­establish a target limiting how much providers and insurers spend on medical care." Of course, it does no such thing because the horse has already left the barn. Recall that just a few months ago, the state's largest insurer awarded Partners a rate increase larger than the statewide average, on a base that was already substantially above that of other provider networks. The goal was to ink this deal before legislation might pass that would limit such increases, as I noted several months before the contract was signed. would allow health spending to grow no faster than the state economy overall through 2017. For the five years after that, spending would slow further, to half a percentage point below the growth of the state’s economy, although leaders would have the power under certain circumstances to soften that target. Providers and insurers that do not meet the spending targets would have to submit “performance improvement plans’’ to a new state commission. Failure to implement their plans could lead to a fine of up to $500,000. The problem, of course, is that a provider network like Partners with costs well above the state average will find it easier to meet the governmental targets than those with lower costs. Why? Because each hospital or network will be judged on its percentage increases. If you have a higher base, you can increase the absolute number of dollars being spent to a much greater extent than those with a lower base and still meet the percentage target. Ironically, again, the state is acting to increase the disparity in costs between the have's and the have-not's. It is enhancing Partners' market power. Some will point to the fact that a new commission "would be required to conduct a 'cost and market impact review' of certain providers, including those that want to expand or do not meet the state’s spending benchmarks." You can be sure that Partners will handle its accounts in such a way as to never be the target of such a review. On the expansion front, in a strategy of burying the money, it has already invested heavily in new facilities. This provides a twofer, avoiding future constraints on its ability to expand without state review while further increasing the cost basis against which future percentage increases will be measured. The ability of Partners to succeed in the political domain has allowed it to get state authorization for mechanisms that will guarantee its market dominance for decades to come. This all represents a superb execution of its business strategy. Staying on message--persistent advertisements and press releases and speeches setting forth the assertions of a concern with cost control--wears people down. In any event, such messages receive no rebuttal or rigorous analysis by the media. Sprinkling money in support of worthy causes buys complacence or acquiescence by advocacy groups. The overall context in the state makes this easier. The local business community fails to be organized around these issues even though the current situation has a huge impact on their bottom line. Indeed, one business group strongly opposed even the limited amount of government intervention contained in the bill. Further, a one-party state offers no chance for loyal opposition in the halls of the legislature. The Faculty of Medical Leadership and Management is a new UK-wide organisation that aims to promote the advancement of medical leadership, management and quality improvement at all stages of the medical career for the benefit of patients. The FMLM blog publishes original articles on a range of issues relating to medical leadership and management. Our blog authors are FMLM members and invited guests from a variety of grades, specialties, backgrounds and geographical locations, each with a unique perspective on leadership and management issues. I have paged through and found a number of thoughtful articles and am pleased to recommend it for your perusal. I have also added it to my blog roll. Two cohorts of interns for the academic years 1999, 2000 and 2001 (n = 304) and 2008 and 2009 (n = 206) at a university hospital were presented with two hypothetical scenarios involving errors that resulted in, respectively, no permanent harm and an adverse outcome. The interns were questioned regarding their likely responses to error and disclosure. About two thirds of fully disclosing interns in both scenarios believed ‘the patient’s right to full information’ to be the primary reason for their disclosure. Prior training about medical mistakes increased more than four-fold between the cohorts. This comparison of intern responses to a survey administered at either end of the last decade reveals that there may have been some important changes in interns’ intended disclosure practices and attitudes toward medical error. We all say the right thing – we are not prejudiced about race or religion, we love mom and apple pie, etc. But what do we do when no one is watching is what makes the difference. Behaviors are much more important than attitudes. People say it is important for safety, but how many reports do people submit? AHRQ data say the vast majority of care givers submit none or a rare one that has to be submitted because of seriousness of harm. Medicine loves to give a 50 minute lecture on something and then call it training and part of a curriculum. We do this with ethics, professionalism, human factors, etc. The question I would have liked to see studied is (1) how many had serious training and (2) saw a disclosure role modeled in the real world by an MD/organization, and (3) then went to work in a place that made disclosure part of their culture (e.g. Michigan, UIC). That would be interesting because I believe most students would say the education and TRAINING (heard real patients describe how bad they were treated when lied to, got to do a simulated disclosure with an SP, appreciated how difficult a conversation it is to do, got feedback through debriefing, etc) helped them prepare for the time they had to do the disclosure communication. That is how we train students to give other bad news (e.g., telling patients they have cancer) and there is lots of data that shows the educational model is beneficial to them later when they have to have that conversation. I believe that is how you change culture…and behavior (not attitude). John Watson, director of operations at Ipswich Hospital NHS Trust in the UK, included the following message in this week's staff newsletter. Going to gemba is at the heart of Lean. This is a great start! Many hospital managers find their time tied to countless meetings, reviews of performance targets and other duties that take them away from the ‘front line’. We lose contact and understanding. However, what we know is once we spend more time out where the work is being done watching what is going on we will be surprised what we learn. We learn that the jobs we are asking our staff to do every day are often not do-able because there are not stable and reliable processes to support them. It helps managers to know what the problems are every day that are preventing our staff delivering waste-free care because we can then prioritise our work. Therefore we have started a weekly process where a group of 20 senior Trust managers block every Tuesday morning to just go out to the front line and respectfully watch what’s happening. Each week we plan to place these managers, myself included, into 20 different areas. This is not checking up on colleagues. This is watching to learn and see where we can better help. Last week I observed Sarah Willingham undertaking the receptioning of the Ophthalmology Outpatient clinic. 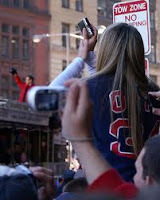 I was struck by her calmness and professionalism despite the relentless pace of how her job needed to be done. I noticed small things that we simply haven’t designed properly to help such staff. Her phone was on another desk and she had to get up repeatedly to answer it or use it to chase notes. My hope is that gradually we find ways to learn from such observations and correct the countless little things that our dedicated staff have to find a way through. If you have an area you would like us to come and watch or if you would like to be involved please let me know. If you have to deal with a work process that you think could be made better and have an idea please let me know or ask us to come along and observe how you try to work with it. This is a simple but small yet crucial step into how we think and act differently. Indeed, Los Angeles Times sports writer Diane Pucin tweeted, "For the life of me, though, am still baffled by NHS tribute at opening ceremonies. Like a tribute to United Health Care or something in US." This prompted a response by @swaldman: "Well, maybe, if United Health Care were government-run and a source of national pride." And another by @MaxwellLeslie: "The NHS is one Britains greatest & most loved Institutions, reinforcing the ignorant American stereotype very well with that tweet." Remember when Don Berwick was nominated to head up CMS, the US Medicare agency? One of the strikes against him by conservative opponents was that he had expressed admiration for the British health system. The National Health Service is one of the truly astounding human endeavors of modern times. Just look at what you are trying to be: comprehensive, equitable, available to all, free at the point of care, and – more and more – aiming for excellence by world-class standards. And, because you have chosen to use a nation as the scale and taxation as the funding, the NHS isn’t just technical – it’s political. It is an arena where the tectonic plates of a society meet: technology, professionalism, macroeconomics, social diversity, and political ambition. It is a stage on which the polarizing debates of modern social theory play out: between market theorists and social planning, between enlightenment science and post-modern skeptics of science, between utilitarianism and individualism, between the premise that we are all responsible for each other and the premise that we are each responsible for ourselves, between those for whom government is a source of hope and those for whom government is hopeless. But, even in these debates, you have agreed hold in trust a commons. You are unified, movingly and most nobly, by your nation’s promise to make good on an idea: the idea that health care is a human right. The NHS is a bridge – a towering bridge – between the rhetoric of justice and the fact of justice. Is the NHS perfect? Far, far from it. [I]n improving its quality, two facts are true: the NHS is en route, and the NHS has a lot more work ahead. Conservatives have convinced themselves that the NHS is a terrible system, which I guess is their right. But insofar as Berwick is actually offering recommendations to government-run health-care systems -- and that's what he's doing here, and what he'll be doing at CMS -- his guiding principles seem fairly inoffensive. 1. First, put the patient at the center – at the absolute center of your system of care. 3. Third, strengthen the local health care systems – community care systems – as a whole. 4. Fourth, to help do that, reinvest in general practice and primary care. 5. Fifth, please don’t put your faith in market forces. 6. Sixth, avoid supply-driven care like the plague. 7. Seventh, develop an integrated approach to the assessment, assurance, and improvement of quality. 8. Eighth, heal the divide among the professions, the managers, and the government. 9. Ninth, train your health care workforce for the future, not the past. 10. Tenth, and finally, aim for health. So, my take is like Don's. Both beloved and berated by the British citizenry, the NHS is a marvelous social experiment that is nowhere near the finish line. With a most dedicated and caring staff and bureaucratic beyond belief, both, it carries the torch forward. In the former colonies (the US), we take on the task in a different way, but we face the same issues. Indeed, as I have noted, "After all, the countries are dealing with the same organisms, both biologically and politically." The two types of systems have a tendency to converge in many ways, "Suggesting that -- in all systems -- a concerted focus on quality, safety, transparency, and process improvement would be well worthwhile." The Obama administration said the Affordable Care Act supported safety-net hospitals in other ways, pointing to measures that raise payments for primary care and give bonuses for improvements in quality. Among 905 764 discharges in our sample, patients discharged from public hospitals (27.9%) had higher readmission rates than nonprofit hospitals (25.7%, P<0.001), as did patients discharged from hospitals in counties with low median income (29.4%) compared with counties with high median income (25.7%, P<0.001). The governor’s plan requires the administration to conduct a “cost and market impact review’’ of any medical provider it suspects is engaging in or plans to engage in anticompetitive behavior. The reporter lets the administration off the hook by never addressing why it needs legislative authorization to do what it already has the authority to do. Until now, the Governor has carefully ducked the issue whenever it has been brought up. His administration has been MIA, notwithstanding the AG's presentation of her annual findings to one of his line state agencies under previously approved legislation. As if those bureaucrats would be any more unaccountable than the people involved in secret negotiations between the dominant provider and the dominant insurer. 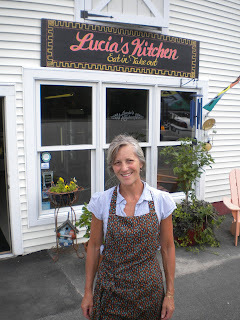 Several years ago, Lucia Velasco-Evans started business in a small roadside stand. Her vision was to offer foods from or inspired by her home land of Mexico. Things went well, and she expanded into this larger quarters. If you are traveling on Route 1 through York, Maine, and are looking for a change from fried clams and other beach food, this is the place to go. Our favorite was the budín azteca: layers of corn tortillas, pulled chicken, mole sauce and cheddar cheese. 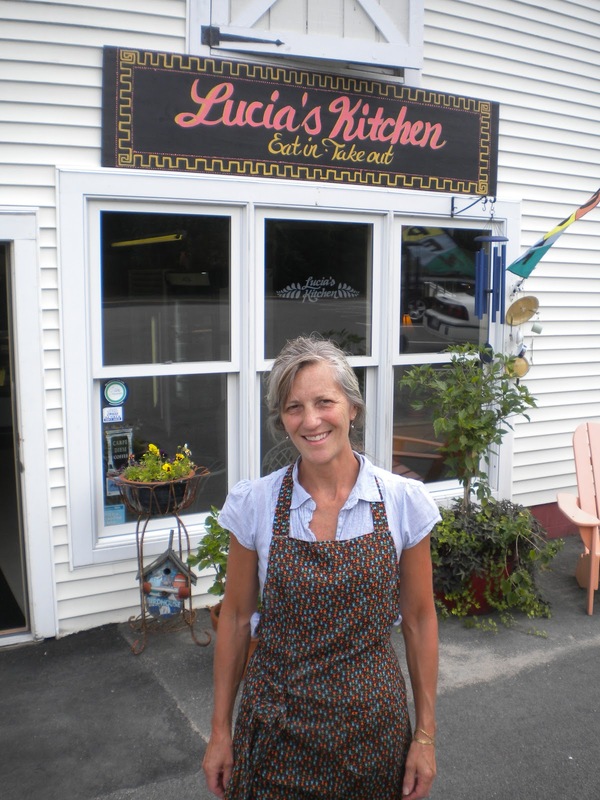 In addition to sit-down and takeout service, Lucia offers catering. Here is the website. I asked when the cookbook would be published. She claims not to have time to do that. The world is less for that, and I am hoping she writes one some day. I suggested she start with Tastebook to make it easy. I have just returned from a very pleasant camping and touring trip to New Brunswick and Nova Scotia, two beautiful provinces with lovely and interesting people. As much as I try to put health care and process improvement behind me during vacations, they somehow manage to impinge, often for unexpected reasons. Here are three anecdotes and observations that arose. I offer them for what they are worth. Again, please understand that the context was always one of warm and caring people, but people who face systemic and societal issues--just like south of the border. The first story is a humorous one that comes from a seafood restaurant in Alma, NB, on the Bay of Fundy. They were serving a linguini and sea food dish (with scallops, shrimp, and haddock), and I asked the waitress if I could please add a lobster tail to the dish. "No," she answered, "all of our ordering is by computer, and there is no button to push to add lobster." "What if you were to talk to the chef and ask him to add it?" I inquired. "It is easy for me to talk to the chef. We talk all the time," she said, "but he can't do it either because there is no button he could use." Hmm, not a very customer-centric or Lean process! While I was tempted to try a Five Easy Pieces approach to the problem, it seemed simpler to just order something else. The second story comes from a community hospital in Nova Scotia. A member of our party had taken a dive into the surf and had been thrashed into the sand by a crashing wave. He bumped his head badly and jarred his neck, and he needed emergency care. Beyond the possible concussion, there was a clear danger of spinal cord injury or broken neck bones. The Canadian health care system is quite good, and we knew we could expect good treatment. What we did not understand is that a person from another country has to personally register and prove his or her ability to pay before going through the ED triage nurse. So, this injured patient was sent to walk to another part of the hospital and spend a good amount of time filling out paperwork--including a promise to be bound by the legal system of the province in the event of a malpractice claim--before being evaluated. Once this was over and the patient could be seen, the doctor immediately fitted the person with a neck brace, just in case there was serious spinal injury. In the US, for all of its health care system problems, no such patient would have been sent to another part of the hospital and required to fill out such forms before being immediately seen in the ED. Also, a family member would have been permitted to fill out the required forms. Also, the patient needed a CT scan, which was not offered in the local hospital. The staff at the local hospital called ahead to the regional hospital and said someone would be waiting for us. We drove to that hospital, about 20 minutes away. Not only was no one waiting, but the person at the front desk wanted the patient to go through all the paperwork again. After persuading that person that the forms were already filled out, the patient was sent to radiology, where the door was locked and no one was visible. Rousing a custodian, the patient finally found the way to the CAT scanning area and found a technician. Again, the actual medical care at each step of this process was excellent, and the clinical staff were attentive, friendly, and professional. And we were through the whole diagnosis in under four hours. I found myself, though, comparing the process with that in the US, where EMTALA rules the day when a patient shows up in an ED, requiring immediate care without regard to legal status or ability to pay. The third story relates to obesity. I have come to understand that this a worldwide problem in developed countries, and the US is a prime example. I did not expect, though, to see it in the Maritimes. More frightening than in the adults, the rate of teenage and young adult obesity was clearly visible. This made me think that Canada, which has done so well in controlling its health care costs, is in for an inevitable uptick over the coming decades. There’s a lot of interest in the Triple Aim in the US, Canada, and several European countries. And it’s no wonder. Ever since IHI conceived of the framework of the simultaneous pursuit of better health, better health care, and lower per capita costs, a whole array of strategies have opened up for health care improvers. Some of the most interesting and groundbreaking strategies have built as much on insights from outside health care as within. And, just imagine if the various communities making headway with the Triple Aim started to think regionally? Well, many are and that’s the evolution we’re going to learn about on the July 26 WIHI, tapping into three related but unique endeavors: IHI’s Triple Aim Initiative (with special focus on recent regional work), the Beacon Community Program (a project of the Office of the National Coordinator for Health Information Technology), and the Robert Wood Johnson Foundation’s Aligning Forces for Quality (AF4Q). These three efforts combined have already impacted nearly 200 communities, to the point where many now realize that thinking regionally is the logical next step. Among other things, a regional focus forces an examination of cross-cutting social issues that affect more than a single community – issues such as unemployment, education, transportation, and crime. One community’s solutions to the needs of an aging population, people with chronic conditions, and individuals with complex social problems might benefit the community next door. Further, a regional outlook necessitates building even broader coalitions, drawing on the expertise of health systems operating in multiple locations, state and municipal leaders, public health experts, urban planners, economic developers, and more. Our guides for the July 26 WIHI are Craig Brammer, Katherine Browne, Carol Beasley, and Shelley Hirschberg from AF4Q’S initiative in western New York. This effort alone has some 270 partners and a portfolio of projects, including health information technology, that point to what’s possible when one starts to act regionally as well as locally. We’ll be identifying other emerging regional “movers and shakers” as well. We look forward to your interest and your ideas on this next WIHI. See you then! I'm taking a blogging break for a few days. See you later in the week. I sometimes hear skepticism from hospital CEOs who are presented with the idea of adopting the Lean philosophy for their institution. "Why does this feel like a religious sect?" "I have no interest in learning Japanese." Putting aside the ethnocentric context for the latter statement, in that the philosophy was actually introduced to the Japanese by W. Edwards Deming, let's admit that Lean is not for everybody. But let's also acknowledge that it can make a huge difference for hospital staff and patients when it is undertaken carefully and in good spirit, with commitment from senior leaders. At every institution, staff at all levels reported improved employee satisfaction. They cited opportunities for front-line involvement in problem solving, employee collaboration across ranks and units, efficiency improvements, opportunities to spend more time with patients, and improved patient experience. Not surprisingly, cost-benefit ratios and return on investment were never explicitly considered when the organizations we studied adopted Lean. Instead, senior executives were committed to improving quality and efficiency. They adopted Lean because it was tractable — particularly when reliable estimates of cost and benefit were difficult to make. Once leaders adopted Lean, none paid much attention to implementation costs. Top managers saw Lean as part of an array of available quality-improvement tools. All said they were pleased with Lean's results. They viewed Lean as yielding long-term process and quality improvements that enhanced their institution's efficiency and financial viability. We cannot be sure that Lean is more effective than other process improvement techniques. But we did find that Lean can be successfully adapted from manufacturing to fit the complexities of health care. A colleague recently quoted a Harvard Business School professor (I forget which one), who said “Businesses are cost structures in search of revenue streams.” I don’t know this professor or what he had in mind exactly, but I want to offer my interpretation. I believe that what he was suggesting that, no matter how innovative or entrepreneurial a firm might have been at its start, once it is has been in existence for some time and has an established place in the social economy, its goal in life is to persist. It leaves the world of innovation, often loses its purpose, and exists solely to exist, i.e., to cover its costs. Often this is a reflection of the corporate hierarchy, where, sadly, leaders lose their sense of providing true value to their customers, intent instead on aggrandizing their own position and preserving their status. The firm no longer reflects the creativity of risk-taking, becoming a bureaucratic shell of its former glory. I have been agnostic with regard to my friend’s assertions. For one thing, my experience in the medical field is of more limited duration, so I could not ascertain whether the change she suggests has occurred. For another, I am more optimistic in nature than she, and so I tend to see half-full glasses rather than half-empty ones. Also, I have been lucky to spend lots of time with hospital leaders like Paul Wiles, John Toussaint, Gary Kaplan, Jeff Thompson, and Ora Pescovitz who represent the vanguard of those focused on the things of most value to the communities they serve. But this week, I was informed of an event that has shifted me more into my friend’s camp. In response to a top ranking by US News--a ranking that, as I have discussed, has virtually no probative value--a local hospital actually organized a celebratory parade of an amphibious tour boat (Duck Boat). 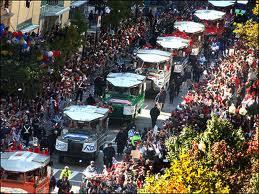 In the past, such parades (admittedly more extensive) have been used to promote the championship seasons of local sporting teams (like the 2007 Red Sox, above), thereby giving fans a chance to yell and scream and applaud their athletic heroes. Now, I am all for celebrating accomplishments. At my hospital, we, too, used to be happy about favorable media ratings, even if we knew they were fundamentally meaningless. But to spend thousands of dollars on a self-aggrandizing circuit (as well as on the right to use the US News logo in publicity) seems to me to reflect exactly the kind of behavior suggested by my friend. How does this kind of activity promote anything good or useful about the provision of high quality and safe health care in the community? It appears to be mainly a commercial activity designed to garner market share and otherwise stimulate revenue growth for an entity that, as I have noted, could do so much more to demonstrate a commitment to the kind of care that some of its own faculty and that of other institutions has been shown to save lives, reduce morbidity, and lower costs. This Duck Boat rally is especially noteworthy when you read the actual words of the editor at US News who notes that the rankings are "to help those who need an unusual degree of skilled inpatient care decide where to get it, especially when there's time to make a choice." Indeed, the parade is essentially celebrating a nullity when it comes to the day-to-day needs of the community in which this hospital is located. I yearn for the day when the hospitals in Boston get together and jointly demonstrate progress in eliminating preventable harm, adopting a consistent approach to front-line driven process improvement, and engaging in truly patient-driven care. Now, that would be something worth celebrating (although I would still omit the Duck Boats.) For models of that kind of behavior, look west to Ohio, Wisconsin, Washington, and Michigan. The hospitals there have been hard at work on that approach--with modesty, dignity, and class--literally leaving many "top" Boston institutions in their wake. If there were something called a Nobel Prize in Medicine, it would be awarded to Peter Pronovost for the number of lives he has saved by his applied research in quality improvement. Oh wait, there is a Nobel Prize in Medicine, but they will never award it to Peter because the way he saves lives is based on the scientific method. Oh, wait the Nobel Prize in Medicine is based on applying the scientific method to questions of broad human health import and is awarded "to the person who shall have made the most important discovery within the domain of physiology or medicine." So, they will never award it to Peter because he applies the scientific method in clinical settings and saves lives today as opposed to engaging in reductionist research in laboratories that may never save any lives. Who knows? Maybe someday the Nobel Prize committee will review the evidence and decide that scientifically conceived experiments and programs in clinical process improvement are worthy of their attention. When that day comes, they need only read Peter’s book Safe Patients, Smart Hospitals to find the source material for the award presentation. But in the meantime, every person involved in the delivery of care in hospitals should read this book. I am not so keen on the subtitle--”How one doctor’s checklist can help us change health care from the inside out”--because that is a highly simplified shorthand for the many lessons contained in the book. Sure, there is the checklist story, first applied to eliminating preventable central line infections. But, as Sullenberger notes, "A checklist alone is not sufficient. What makes it effective are the attitude, behavior and teamwork that go along with the use of it." A checklist applied to an organization that has not engaged in a cultural change that promotes respectful relationships among the clinical staff--described by Peter as a comprehensive unit-based safety program--will fail. Peter’s contribution is explaining how to create such an environment and in telling the story of his successes and failures along the way. We went to the doctors and nurses and encouraged them to change the antiseptic solutions . . . but the staff didn’t know how to make this happen. . . . So we sent all the CEOs a memo asking them to make sure that, within on e month, every hospital stocked chlorhexidine in their central line kits. . . . In one month it was done. 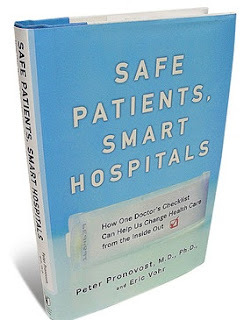 Every hospital can accomplish the kinds of changes described by Peter in this book. But they have to want to. To quote Jim Womack, "Whether you think you can or you think you can't -- you're right." Right. Now let’s get back to that Nobel Prize committee. Many thanks to Tim O'Reilly @timoreilly for sending me this thoughtful piece by Richard I. Cook, MD, from the Cognitive Technologies Laboratory at the University of Chicago. It is a pithy article with a long title: "How Complex Systems Fail (Being a Short Treatise on the Nature of Failure; How Failure is Evaluated; How Failure is Attributed to Proximate Cause; and the Resulting New Understanding of Patient Safety)." Some excerpts follow. If you are not careful, you can quickly fall into a terribly pessimistic view of the potential to improve quality and safety in clinical settings. But if you think about it a bit more, you can see that having a "learning organization," one that constantly strives to be very good at getting better, is the best answer we have. evaluations based on such reasoning as ‘root cause’ do not reflect a technical understanding of the nature of failure but rather the social, cultural need to blame specific, localized forces or events for outcomes. The sad story of Rory Staunton, the young boy who died of sepsis infection, has been prompting a lot of commentary. I have noticed that is the nature of press coverage that it often takes a sympathetic figure to get attention to a long-term, systemic problem in the health care system. I have written here of the efforts of Dr. Jim O'Brien and others at the Sepsis Alliance to help doctors and nurses learn of the early warning signs of a sepsis infection. Let's hope that the recent story will give a greater impetus to the expansion of training about this important clinical problem. When you see an ad like this accompanying such a sad story, you are tempted to click through to actually see how "Partners is changing health care for the better" with regard to the types of issues elicited in the story. What do we find? I don't mean any of this to suggest that this provider group is not trying to provide excellent care. I know many of its doctors and nurses and have found them to be impressive and well intentioned people. It just seems that this provider system is so intent on messaging for political purposes that we don't get to learn what they have done about the kind of misdiagnosis and mistreatment seen in the Staunton case, or for that matter what they have done to eliminate harm in other settings. After all, there are many impressive and well intentioned clinicians throughout the United States who still collectively represent the fourth or fifth ranked public health hazard in the country. I have noticed that the media in this city gives this provider group a bye on these issues. Perhaps the reporters are so busy covering legislative debates on cost issues that they don't have time or inclination to see what's being done--or not being done--to stop killing and maiming patients. So, here's my suggestion to enterprising reporters. Let's consider who in Boston is most associated by the public at large with ideas for improving the quality of care. Among that group is clearly Dr. Atul Gawande, a physician in this very provider organization, who has done superb work in this field. A reporter might compile a list of the major conclusions in Atul's books and articles. Then, the reporter could take Atul's recommendations for improving the quality of care delivery and see the extent to which they have been adopted by his hospital and by the entire health care provider network in which he works. The Partners hospitals are full of well intentioned, dedicated people. But there has not been a corporate public commitment to reduction of harm and to transparency of clinical outcomes that could help build broad public confidence in the quality and safety of patient care.... Ironically, some of the world experts in these matters are faculty members in his hospitals. The Partners system should be a world leader in the science of health care delivery, along with the fields in which it already holds prominence. I'm not saying all of Atul's ideas are necessarily the right ones for all organizations, but should not the major provider group be held accountable to show how they have implemented his ideas, or if not, why they have not? Who knows? There might be some good news on this front worthy of publicity. If so, perhaps future banner ads will click through to more relevant success stories. This is a very important article by Brian Klepper on Medscape. It is entitled: "Will Anyone Listen When Former CMS Chiefs Call For More Objective Physician Payment?" Pay particular attention to the parts about the committee that establishes the relative rates paid by Medicare to different kinds of specialists, a formula that affects virtually all private insurance companies as well. There was a general sense that the RBRVS system was built on a series of errors, and that CMS' relationship with the RUC started off, to use Dr. Wilensky's term, "innocently enough," but has become increasingly problematic over time. Tom Scully, CMS' Administrator under George W. Bush, took responsibility for helping facilitate the AMA's involvement and was perhaps the most passionate that it had been an error. One of the biggest mistakes we made ... is that we took the RUC...back in 1992 and gave it to the AMA. ...It's very, very politicized. I think that was a big mistake...When you go back to restructuring this, you should try to make it less political and more independent. I've watched the RUC for years. It's incredibly political, and it's just human nature...the specialists that spend more money and have more time have a bigger impact...So it's really, it's all about political representation, and the AMA does a good job, given what they are, but they're a political body of specialty groups, and they're just not, in my opinion, objective enough. So when you look at the history of it, CMS is starting to push back more, which is a good thing, I think it would be much better to have an arms-length transaction where the physician groups have a little more of an objective approach to it. And, look, that is the infrastructure of $80 billion of spending. It's not a small matter. It's huge. But perhaps the most striking statement was made by Bruce Vladeck, HCFA Administrator during the Clinton Administration. In speaking about the problems generated by RBRVS (and by inference, the broader issues of SGR and the RUC as well) in the face of severe economic stresses, he called for the leadership and will required to simply do the necessary course correction. I'm hopeful that some combination of the need to address overall deficit reduction strategies more generally and a different kind of political climate in the relatively near future will create the opportunity for people to say, "We made a mistake in 1997. We created a formula that produces irrational and counterintuitive results, and we're just going to abolish it and start all over again in terms of some kind of cap on Part B payments. It's the only way we're going to get out of this morass." In a policy environment less susceptible to influence and more responsive to real world problems, the gravity of consensus on display at this roundtable would justify a call to action. As it was, it validated what many know: that we are rushing headlong down a catastrophic path, steered by forces other than reason and responsibility. The best we can hope for is that someone with authority and courage is listening. 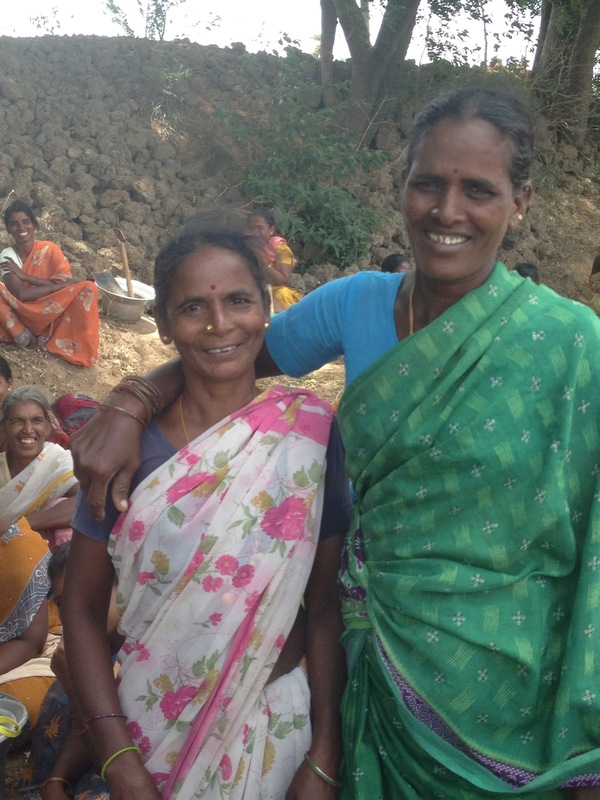 These women are part of the Mahatma Gandhi National Rural Employment Guarantee Act (MGNREGA). It is an act that aimed to eradicate rural poverty by providing eligible people (below the poverty line) with manual labor for minimum wage. The project we visited was in a village that was renewing a Kai Rassi clinic with this NGO, Hand in Hand. A Kai Raasi clinic takes place once a week or once every two weeks and provides basic healthcare and medicines to the people. They are required to pay 20 India Rupees (less than a dollar!) and they see a qualified doctor. The doctor often gives them referrals to go to government hospitals if needed and Hand in Hand workers ensure that they get there. Hand in Hand supplies the clinics with medicines like soft pain killers and anti-diarrheals. The workers were very excited--as was the local government leader--to be renewing the clinic. Here is the link to the Wikipedia page on the government scheme. I'll point your attention to the criticisms section, as it is very interesting. During this particular visit, one of the Hand in Hand Workers, Ms. Rajeswari, was counseling the women on causes, symptoms and consequences of anemia. Anemia is a huge problem here. She educated them about iron tablets they should be taking and foods they can be eating to raise their iron levels. Here's a picture from another work site we visited. There are a lot of awareness programs going on through Hand in Hand, and they aim to educate villagers on their health rights and major health issues. In this particular one, we talked about loans they can be given to construct toilets and renovating local Anganwadi centers that act as day care for village children. They are given a nutritional lunch while attending, aiming to eradicate malnutrition. A coda to my visit to Israel was an article from the newspaper Haaretz that I read in the airplane as I flew off. It was by Aner Shalev and was entitled, "We have an interest in remaining alive." The Carmel fire, the 1997 helicopter disaster, the Second Lebanon War, the Yom Kippur War -- this year we had an even greater disaster, but no commission of inquiry looked into it. In this year's disaster, we lost more people than in those two wars together. It's an ongoing battle that claims about 4,000 casualties every year, according to official figures that have probably been toned down. We lose this battle time and again -- but it seems nobody cares. Israel's hospitals, which are supposed to save us from illness and injury, have turned into our worst killing fields. On top of this, the Health Ministry has statistics about infections at our hospitals. The ministry published these figures recently, without mentioning the hospitals' names. The pressure to publish this vital information was warded off with the strange claim that it wasn't of public interest. Israel has a marvelous, universal public health system of which it should be justly proud. But like every other developed country, Israel has a problem with the amount of harm -- mortality and morbidity -- caused by its hospitals. I don't know if this author is correct that the amount of preventable harm is under-reported, but I do know something we have learned throughout the world: If there is not a clear presentation of the degree of harm that exists in each hospital, there will not be and cannot be an effective effort to reduce it. Jim Womack and I changed venues in our Lean mission today, moving from the main campus of the Hadassah Medical Organization in Ein Kerem, Jerusalem, to the smaller (300-bed) community academic hospital at Mt. Scopus. This was the original Hadassah hospital, abandoned in 1948 after several dozen staff members, including the director-general, were massacred on their way to work. It re-opened in the 1960s, but after planning and construction for the new large hospital had occurred. It serves a mixed Jewish and Arab clientele, and its staff also reflects that mixture. The building is lovely -- old-fashioned and warm -- as are the people working in it. We started with a quick gemba walk. Here Jim is seen with emergency department chief Ruth Stalnikovitz and hospital director-general Osnat Levztion-Korach -- historical note, formerly known as just a regular doctor!) Then it was off to a general assembly with staff about the nature of the Lean philosophy. Jim pointed out that, properly executed, it can lead to better patient outcomes, a better patient experience, a better staff experience, and not coincidentally, lower costs. The last is true because many activities that lead to bad outcomes, and poor patient and staff experience, add cost. I then provided examples from BIDMC, including a dramatic improvement in the patient experience in the orthopaedic clinic and improved viability of blood samples from the emergency department. I added some thoughts about the importance of transparency in an organization that wishes to hold itself accountable to the standard of care to which it aspires. Jim and I both left with the feeling that the Mt. Scopus hospital has tremendous potential to benefit from the Lean philosophy and hoping that the leadership and staff of the hospital will choose to embrace it. One of the more worthy projects over at Kickstarter is The Waiting Room -- What are you waiting for? This is a moving and important video produced by Peter Nicks and his colleagues about people in an Oakland hospital waiting for and delivering care. Pete notes, "It's an unfiltered view of patients and caregivers at one public hospital that allows the audience to experience and feel one part of our health care system in a way films rarely do: by placing the voices of patients and caregivers firmly up on stage." From the very beginning, this project has been about giving a voice to the millions of people that lack health care insurance. But it is also very personal for me. The Waiting Room developed from stories my wife, a speech pathologist at Highland Hospital, told me about the struggles and resilience of her patient population. And a few years ago, as the contentious vote for health care reform got louder, it occurred to me that the people who were not participating in the debate were the very people we were fighting over: those stuck in waiting rooms at underfunded public hospitals all over the country. As the film is independently produced, the Kickstarter campaign is to raise money to launch a grass roots and community outreach initiative to support its release in the fall. Pete explains, "The more successful these initial openings are, the wider we can expand across the country, bringing the film to more and more people." The film has gotten excellent reviews and deserves to be seen broadly. Please support it here. But do it soon, as there are only a few days left in the Kickstarter campaign. In my speeches and presentations in front of US audiences, I often make mention of the financial cost, as well as the human cost, of preventable harm in hospitals. When abroad, I assert that the level of harm is roughly proportional to the population of the particular country. This is irrespective of the institutional scheme of funding health care -- nationalized, private payer, public payer, single payer, multiple payers. Such is the case because the systemic determinants of harm are related to the training received by medical providers and to the design of work associated with care delivery in hospitals, which are remarkably similar throughout the developed world. In the release of the paper ,"The Economics of Patient Safety in Acute Care," researchers have calculated an estimated economic burden of preventable patient safety incidents in acute care in Canada for 2009 - 2010 to be $396,633,936 ($397 million). This estimate is only a small portion of the estimated entire cost of harmful incidents, and it does not include the indirect costs of care after hospital discharge, or societal costs of illness such as loss of functional status or occupational productivity. Jim Womack and I continued our Lean mission today at the main campus of the Hadassah Medical Organization in Ein Kerem, Jerusalem. We started with a gemba walk through the emergency department and then up to the internal medicine wards. I had seen these areas a couple of days ago, but Jim has just arrived. As always, he asked great questions and had thoughtful observations, particularly about the problem of patient boarding in the ED. Later, we both participated in a hospital-wide session organized by CEO Ehud Kokia. His purpose was to provide the staff with an overview of the purpose of the Lean journey and also to offer progress reports on some of the process improvement work that has been occurring to date. Jim and I were then asked to provide our view of the Lean philosophy and its chance for success at Hadassah. 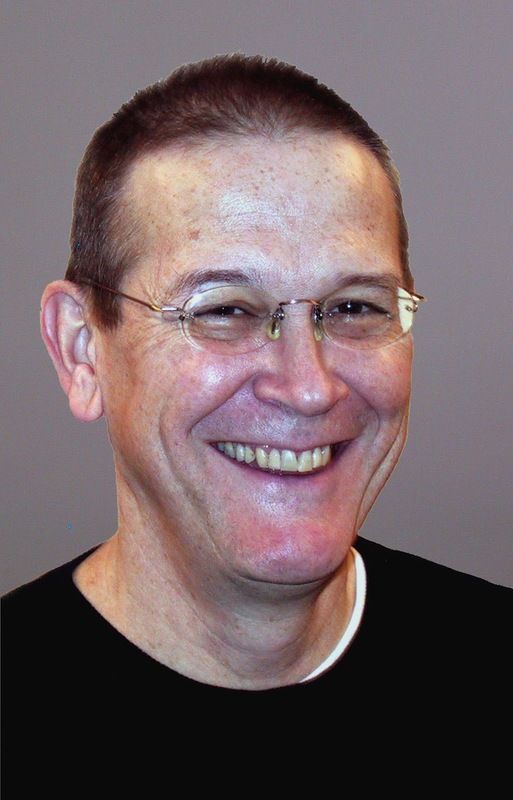 Jim was characteristically blunt, noting that he had reached a diagnosis -- a hospital characterized by a traditional management system -- a prescription -- a hospital in which both horizontal management and vertical management would exist to support cross-functional process improvement. But he demurred on the prognosis, saying it was too soon to tell. Quoting Henry Ford (an irony in light of that person's creation of the dehumanized assembly line model), he said, "It depends on you. "Whether you think you can or you think you can't -- you're right.'" My talk followed with some stories from our Lean experience at BIDMC, with (no surprise to this group of readers) analogies to soccer. 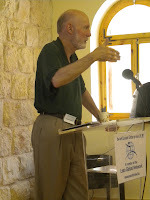 Picking up on Jim's conclusion, I suggested that a sign of success at Hadassah would be the elimination from conversations of two words that suggest defeatism and acceptance of the status quo, kacha zeh, "It is what it is." How do you say "Lean" in Hebrew? "Lean." Boaz Tamir of Israel Lean Enterprise has created a "Lean Club" comprising a small group of Israeli corporations and institutions who get together four times a year to share experiences, problems and success as they undergo their Lean journeys. The group includes senior level executives from banking, insurance, food processing, high-tech, and health care. Because the firms are all at different stages of Lean adoption, the diversity of viewpoints is stimulating and valuable to all. Boaz started today's session with a reminder about the differences between traditional managerial approaches and that envisioned in a Lean organization. The slide shown here presents a quick summary. 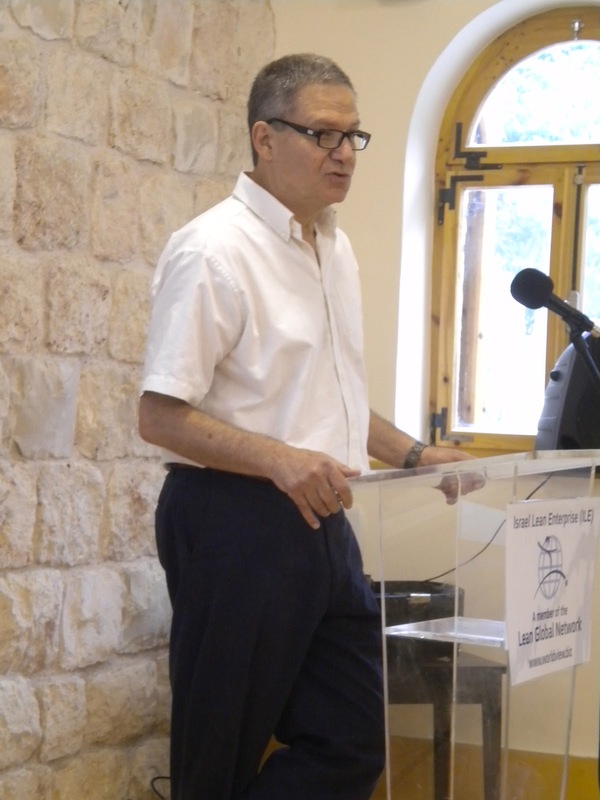 Boaz stressed that changes in the world economy would be filtering through to these businesses in Israel and suggested that Lean principles could help companies survive and thrive in the face of an avalanche of difficult events. Today's special guests included Jim Womack, acknowledged world expert in the field. Jim has a way with words, spinning out stories and theories about Lean and non-Lean organizations. Both entertaining and informative, he makes it easy to learn. He reminded the group that a firm needs to be clear about its purpose, but that this needs to be thought about from the customer's point of view. He noted the schizophrenia we all exhibit -- being providers and producers in our corporate roles, but immediately flipping over to consumers when we go home from work. Jim drew some comparisons between the desires of the two groups. For examples, customers want transparency about the cost and quality of goods and services. Businesses have often relied on opacity in selling their products and services. He reminded those in the room, "All of you are mature businesses," and so your assets are threatened by changes in the marketplace. "You think of how you can protect your undepreciated assets, but your consumers want something new." Thus, "there is a disconnect between customers' and companies' valuation of assets." Jim said, "This is part of life." Firms need to adjust to the fact that the frequency of the need to re-evaluate customers' needs is accelerating. But, he noted, "It is not just assets that are threatened. It is your processes." He pointed out that traditional corporate folks who conduct process evaluation often do not think about customers. 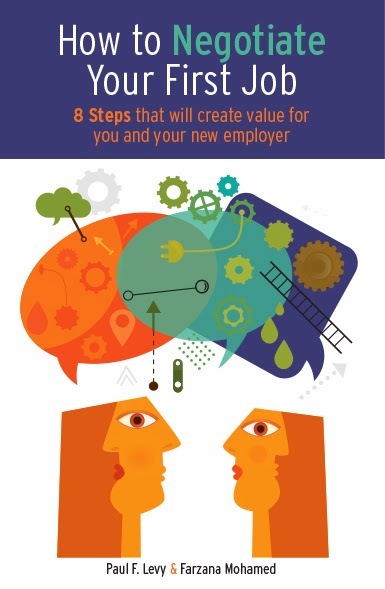 They often pursue enhancement to processes that don't bring value to customers. He reminded us that "all processes involve people." Therefore it can be threatening and frightening to people in a firm when process design is coming. The irony, though, "is that you can't develop new processes without people." Hearkening back to Boaz's points, he said that it takes a different kind of management to work in a Lean way. Unfortunately, he noted, "management thinking is often impoverished." These were sobering thoughts, even for this group of executives who are committed to Lean, but the group had an upbeat attitude and took Jim's comments in stride as they engaged in collaborative learning during the session, sharing stories and challenges from their own experiences. I spent the day at the main campus of the Hadassah Medical Organization today in Ein Kerem, Jerusalem, with staff members engaged in learning about and experimenting with Lean process improvement. I think the hardest thing for people to accept about Lean is that it is a philosophy based on incremental steps rather than major revamping of complex systems. The idea is that small advances lead to great gains over time. Your front-line staff encounter a problem in the workplace and then you design an experiment to try to solve the problem. Then you evaluate the effectiveness of the experiment and, if necessary, redesign it. If it works, the new "current state" becomes the basis on which you then try to move to yet another improved "future state." The process never ends. Every hospital I have ever visited has a problem discharging patients in a timely manner, and Hadassah is no exception. This is an important problem to fix for obvious reasons, but there is a not-so-obvious reason as well: When patients do not leave the wards, it creates a back-up in the emergency department. Patients find themselves spending hours awaiting a room upstairs. On one internal medicine ward, Murielle Cohen, the chief nurse, and Professor Dror Mevorah, the chief attending physician, are testing out a simple experiment, whether a white board listing all patients possibly eligible for discharge, along with each step required in the discharge process, might facilitate communication between the nursing staff and the doctors and others to move things along. During my tour today, they were joined by Chana Tsurel, manager of the internal medicine department, and Pnina Sharon, head nurse of the ER, both of whom have been working to improve communication between the two departments. In the eye clinic, another approach was taken by head nurse Sigalit Cohen and her physician and technician colleagues. They faced a problem of long waiting times because a certain injection procedure was batched once per day. By adding a second session, they were able to improve the flow of patients through the clinic. Both of these examples are small steps forward in a big hospital that has not yet become fully engaged with Lean. But they offer the possibility of confidence building measures that will help persuade doctors and nurses that there is potential for broader improvement if people make the commitment to Lean principles. I'd like to explain all the things wrong with this, but I would just get upset. Let me provide the simple explanation. You don't "do Lean." Lean is not a program. It is a long-term philosophy of corporate leadership and organization that is based, above all, on respect shown to front-line staff. 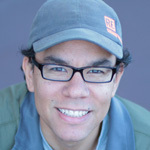 There are two essential aspects, training front-line workers to be empowered and encouraged to call out problems on the "factory floor," and training managers to understand that their job is to serve those front-line workers by knowing what is going on on the front lines and responding in real time (when problems are fresh) to the call-outs. Yes, there are all kinds of methods and tools and terminology, and as Virginia Mason Medical Center's Sarah Patterson notes, "Lean provides a common language for process improvement." She also reminded us, though, that it is a focus on process, not on the outcomes. The idea is to "build key features into processes that are waste free, continuous flow." To do this we need to "grow leaders-- to respect, develop, and challenge your people." I hope that those of you who have been following my commentary about our Lean workshops at Ipswich Hospital NHS Trust will have seen an emphasis on these points. You will have also seen that we employed on a pedagogical approach that relied heavily on going to gemba. You cannot teach respect for front-line staff by sticking people in an off-site conference facility for a week. You cannot teach people to notice the problems in work flows if they are not looking at the work flows. You cannot teach the principles of incremental improvement and experimentation if you direct managers and staff to spend all their "Lean time" on time-consuming projects in "priority areas." Jim Craig (seen here shadowing a person during the workshop) told me this story after we were done. He was walking through a ward and heard a trainee grumbling about something. He went up to her and said, in a friendly way, "I happen to overhear that you were upset about something. Would you mind telling me what it was?" The answer was that, many times per day, the resident would need to print out a form from the computer. But the ward was a large ward, and the one printer was at the extreme end of the floor. So, when she was seeing patients at one end of the floor, the resident would have to spend 5 minutes each time walking across the floor and back as she collected the form. Jim said, "Would it help to have a printer at each end of the floor?" "Oh, yes," was the reply. Then and there, he called the IT department to arrange a printer to be delivered. Result: A very grateful trainee, who will now have more time to be with patients rather than fetching papers. The Lean aficionados out there are already fidgeting, for they have noticed other potential solutions to this problem. And they are asking questions like, "What is the form itself, and does its production add value." Those would be good things to explore. The lesson, though, is that Jim was at gemba, heard the (unintentional) call-out, responded respectfully, and analyzed and solved the problem while it was fresh. I give him an A+ for demonstrating what he learned at the workshop. Well, let's make it an A- so he knows there is always the potential to improve! Living with two chronic — and sometimes critical – neurological conditions made me realize that I had to start standing up and being an active partner with my health care team. No one else would be there to tell my side of the story or speak up for what I really wanted to do when my condition worsened or when it was time to explore new ways to get me back to my normal status. The next chapter in my journey as a patient began when I was invited to be part of a patient panel for the Patient, Client and Family Centered Care Workshop in October 2010. This was a very emotional event for me, because I had to share some of my worst care experiences with many of the people who had cared for me. But I felt that doing this was an important part of my being able to be an advisor. Many of those who heard my stories came up to me afterwards and told me they too remembered the events and were so sorry for the pain I felt. This was a learning event not only for me but for them as well. After this, I was asked to be a patient advisor in both the Neurology and Rehab departments and the ICUs in Saskatoon. Is it scary being involved in these advisory boards? Absolutely! But when I see all the wonderful things that can come out of this work, I am happy that I’m involved and I’m happy when new families and patients join. I deeply care for those who have saved my life so many times. But health care, like most things, is not all rosy. If I can help make things better for staff, then I know things will be better for me and other patients. Blogging feels like the next step in my evolution as a professional patient. I see it as a way to help bring the voice and perspective of patients and families to an even wider audience, to become part of a larger dialogue about making health care better. Trusting myself and listening to my inner voice has helped make me a better partner in my own care and get the best possible care possible. I hope that my stories and experiences resonate with others – not only patients and families – but also people managing and delivering health care.